Well hello there — how do you do? My name is Simone and I’m waiting to meet you! 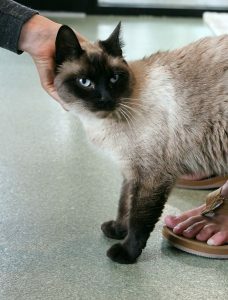 I am a gorgeous female seal-point Siamese mix that is about 2 years old. Although I don’t seem to be a big fan of other cats, I am a HUGE fan of people and will seek people out for all the attention and pets I can get! Even though I’m Siamese, I don’t have a big meow — I actually have a cute little “mew” that I will give if you’ve got a lap for me to snuggle into. I’m still young and have a lot of interest in playtime as well! 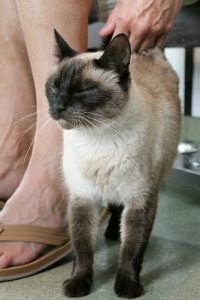 I was living in the Pixie cattery and was very tolerant of the other cats, but I definitely seem happiest as the one-and-only feline. I’m great around kids and people of all sizes! I’m just a young, social, spoiled little girl who is missing one thing — my family! Are you interested in falling in love? Come meet me at Petco Unleashed on NW 23rd & Burnside today! I come to you fixed, vaccinated, and micro-chipped for an adoption fee of $100.